A masters in String Pedagogy is designed to prepare students to enter the teaching profession with a private studio or to prepare for a terminal degree (doctorate) and ultimately a career in higher education. What makes our pedagogy program unique is the combination of top level performance teachers and the hands-on teaching opportunities with students of all levels provided by the String Academy of Wisconsin at UWM. The faculty of the String Academy are specially trained in and dedicated to the education of young people. 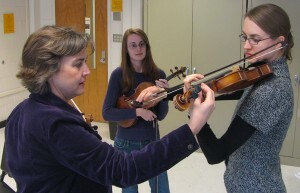 Curriculum focuses on current methods such as Suzuki and Rolland, and organization teaching of instrumental technique and repertoire. Minimum degree requirement is 34 graduate credits, all of which must be in specified music areas. Applicant should contact faculty in the appropriate string and String Pedagogy areas to inquire about audition and additional entrance requirements. 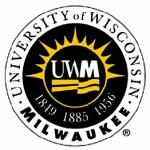 While prospective students are not required to submit Graduate Record Examination scores, they are strongly advised to take these tests before or early in their graduate work if they wish to be considered for a UWM Graduate School Fellowship or if they plan to continue their graduate work after completing a master’s degree at UWM. Undergraduate music course background must include adequate preparation in music theory demonstrated through satisfactory completion of Music Theory, Levels I, II & III; Materials 127, 128, 226; Aural Skills 123, 124, 225; Keyboard Harmony 125, 126, 227; Form Analysis 230, Materials of 20th Century Music 421 – or equivalent courses. A Graduate Music Application (available upon request from the Department of Music, 414-229-5162). The student must have a major professor to advise and supervise the student’s studies as specified in Graduate School regulations. A student who is not assigned to an advisor at time of admission should immediately contact the Director of Graduate Studies. Minimum certificate requirement is 24 credits; minimum master’s degree requirement is 33 credits. Each student follows an integrated curriculum in which all subjects are related and no course is optional. The student must complete all degree or certificate requirements within four years of initial enrollment.